Download this Quick Resource Guide to your phone. Fire: Learn about fire emergency procedures from the Office of Fire Safety and Emergency Planning. Earthquake: Learn about earthquake emergency procedures from the Office of Fire Safety and Emergency Planning. 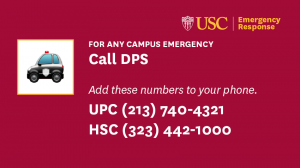 Active Shooter: The USC Department of Public Safety (DPS) has created a one hour training session tailored for students, faculty, and staff on what to do in the event of an active shooter. Learn more about the recommended “Run • Hide • Fight” protocol. 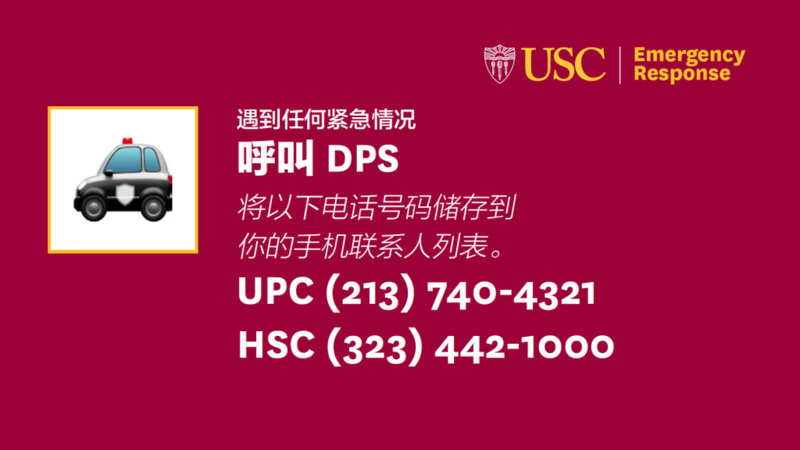 Learn more by viewing separate video modules on emergency preparedness from the Office of Fire Safety and Emergency Planning. Each video module addresses a specific topic, and users may skip or replay modules as desired.